This is not your grandfather’s SharePoint! SharePoint is alive and well, in the cloud and on prem, and it's all about you! This morning (May 4, 2016), I had the pleasure of being in San Francisco for Microsoft’s “Future of SharePoint” event, which coincided with the general availability date for SharePoint 2016. This is the second time I’ve been in San Francisco for a major SharePoint event. The last time was in 2003, for the launch of SharePoint 2003. It’s amazing how far things have come in the past 13 years! The future of SharePoint is now – and the future is all about you and me – and making it easier to connect and collaborate and get work done in a way that brings the information we need to make key decisions to the places we need it, in the format we need it in, and on the device we are currently using. The future of SharePoint is all about people – and there should be no doubt that Microsoft is continuing to invest in providing great people experiences with SharePoint. While I am super focused on user experiences in SharePoint, and Microsoft has shown users a whole lotta love in the announcements today, developers are going to be pretty happy too – along with the folks focused on security and compliance. In fact, no matter who you are, if you have ever said, “I wish it were easier to [fill in the blank] with SharePoint,” you are probably going to get your wish fulfilled very soon. There was a lot announced today. 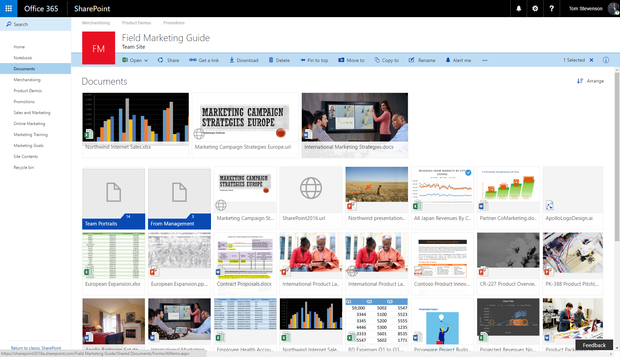 Too much to cover in one blog post – which is why Microsoft has a whole bunch for you to review! Here are links to the Microsoft blog posts released this morning. The posts also include links to videos that provide even more detail – so you’ll have plenty to keep you excited and engaged. The Future of SharePoint – Jeff Teper’s post providing an overview of the future for SharePoint. SharePoint Server 2016—your foundation for the future – A must read for on premises users. SharePoint on premises got a lot of love today and Microsoft made it very clear that they are very committed to on prem in addition to the cloud. SharePoint – the mobile and intelligent intranet – One thing is for sure, this is not your grandfather’s SharePoint! A key theme of the announcements today was “your intranet in your pocket.” It’s really exciting that the new SharePoint mobile app will provide great user experiences for your pocket device – but your browser is going to be very happy too! Please take a look at this post in detail – because some of my very favorite aspects of today’s announcements are reviewed in this blog. The SharePoint Framework – an open and connected platform – This is the post for developers. Microsoft is going to make it much easier for customers and professional developers to innovate on the great capabilities and features in SharePoint - and drive them to the next level. SharePoint is evolving to embrace current trends in development. The SharePoint Framework is a Page and Part model that enables fully supported client-side development, easy integration with the Microsoft Graph, and support for open source tooling. In this post, I’d like to focus on a few of my favorite “people-related” capabilities featured among the announcements today. Updated the “last mile” document experience. Many, many organizations have spent a lot of time and energy creating visually appealing “front doors” for SharePoint document library content. However, once you open those doors, you are still looking at a document library – which hasn’t changed much in appearance since SharePoint launched back in 2001. That’s all about to change. The new document library experience is going to delight business users because it will make it easier to find what you need to work on – on any device. In addition to making it easier to move and copy documents, there is a feature that I think is particularly awesome – the ability to “pin” important documents to the top of a view. Have you ever wanted to feature a document that doesn’t naturally sort to the top of a list and had to apply a “work around” by adding a sort order attribute or re-naming the document to start with a special character? Do you have one or two documents that are the most frequently needed or provide context for the rest of the library? This simple little feature will save you from having to create a complicated work-around. You can now “pin” the most important or frequently needed documents to the top of the list or, even better, pin the instructions or guidelines for using the library (think “in context” governance or training information) right where users need it. But wait, there’s more. Not only can you pin a document, you can also pin a link to a file or folder located in a different document library or website. Learn more about how SharePoint Online document libraries have been updated in this article. Lists are also getting some love with a refreshed new look. Essentially, their look will be similar to the modern document library. These new experiences are more than just a spa treatment – the new experiences are about making it easier to get work done and find what we need to work on – on all of the devices we use to work. The new SharePoint Online document library experience aligns with the visual user experience in OneDrive. File sharing governance best practices made easy. Another feature I’m particularly excited about reflects the way most of us typically work – even if we know we should be sharing all of our documents in our SharePoint team site at each stage of the life-cycle. Our documents typically start out privately – on our local hard drive or in our personal OneDrive for Business library. Even though we can, I have rarely seen anyone create a document in SharePoint. The more typical behavior is to first create a document for ourselves and then once we are happy with it, we copy it to our team site. Yes, we typically copy, not move – even though we know we should really move so that we don’t have a different version on our computer than the team is working with in SharePoint. Copy from OneDrive for Business to SharePoint Online document library. Why don’t we follow the practice we know is better (moving rather than copying) – and helps minimize version control issues? The most common reason is that it’s not really easy to move a document to SharePoint. 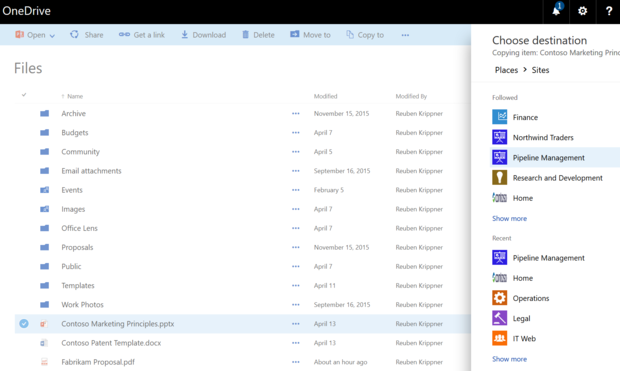 It’s not even easy to copy a document from OneDrive for Business to SharePoint. In other words, the best possible practice for collaboration and sharing breaks down because the software doesn’t align with the way we work. 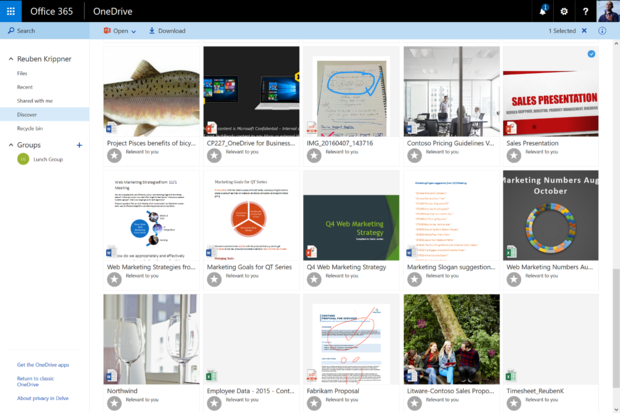 In the next few months, Microsoft will roll out a feature that will allow you to copy a document from OneDrive for Business to SharePoint – quickly and easily. And, later in the year, the feature I’m really excited about will arrive – the ability to move a file as well! That will minimize the risk of having the “versionitis” disease spread in your organization – and help minimize compliance risk at the same time. New team site home page. Team Sites are also getting a people-friendly overhaul. The new team site “front door” is visually engaging and designed to make it easy for you to quickly find the information you need with a much more intuitive user experience. You won’t have to listen to users saying, “Please make it not look like SharePoint” much longer. The updated SharePoint Online team site home page brings important documents and site activities to the forefront, with clear visibility to the associated group in Office 365 Groups and its members. Simple page authoring for better and more consumable stories. Microsoft is also introducing a new page authoring and publishing experience with a new responsive design that can run in the web and the new SharePoint mobile app. Every team site will come with the ability to quickly build out and publish professional, polished reports and pages. Successful intranets and team sites provide information to users in a way that makes it easy to consume. The new page experience won’t write your content for you – you still have to follow best practices for writing for the web – but it will provide you with a better framework in which to tell your story and present your information. And at the end of the day, that is what is most important – creating content that people actually read. It’s not about just posting a document to a library and saying, “it’s on the intranet.” Business value comes not from what you post, but what gets read! That means you have to write “consumable content.” The new page authoring framework will help you do that. Groups and Team Sites: two great things that are better together. The new team site experience will roll out later this summer and as part of the new experience, SharePoint team sites will align with Office 365 groups – bringing the best of the two collaboration worlds together. Every group will have a team site, which gives team sites the benefit of simple membership management and gives groups the benefits of metadata for information classification and compliance. Going forward, you won’t have to say – Groups or Team Sites? It’s not either/or – you get both! Why are these new features so critically important for you and your teams? Because when it comes to collaboration, your teams are always going to look for the easiest way to get work done. Aligning Groups with Team Sites brings the best features of both capabilities to a single solution that will hopefully prevent users from finding “rogue” solutions that they feel are easier to use. I have a client where users frequently need to work with external partners. Though they can technically set up extranet sites today, very few teams use them. During our initial stakeholder analysis, we identified more than 20 rogue IT collaboration solutions across the organization, with duplicate copies of documents in multiple places and critical corporate assets stored in unmanaged and ungoverned “containers.” Irrespective of the information security risk, this organization suffers from a massive productivity hit because users never really know what version of a document they are working on and which of the many possible solutions hosts the document they need. If we can make it super easy to do the right thing by providing a team site experience and document collaboration experience that is intuitive, user-friendly, and simple, we will not only achieve our compliance objectives, but we will also make it easier for people to connect and collaborate and get work done! Microsoft talked a lot today about “intranet in your pocket.” I totally agree that mobile intranet experiences are important – but I’m not quite totally on board that having the entire intranet in my pocket all the time is as important as having mobile access to the intranet apps that I need to get work done. For that, I’m really excited about PowerApps and Flow. Both PowerApps and Flow are planned to be built right into SharePoint Online Document Libraries and Lists, which will help automate business processes quickly and easily on the go. The SharePoint home in Office 365, accessed by clicking the SharePoint tile in the Office 365 app launcher. 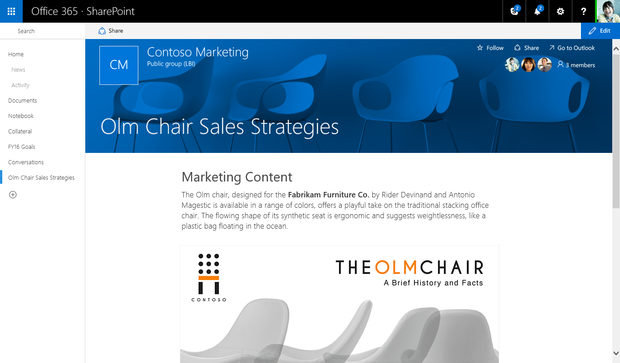 That said, the new mobile SharePoint app will bring the entire intranet to your mobile device when you need it. And whether you are on your mobile device or in your browser, the Sites tab is now re-branded as what it really is – SharePoint – and when you get there, you will see more than just a list of links, but a page powered by the Office Graph that shows you the sites that you need the most with the most recent activities associated with those sites – to help you decide whether you need to go visit them. When we were starting up the knowledge management program at the consultancy where I worked in the early nineties, we envisioned a future where we would start typing about a topic – for example beginning a proposal about a strategy engagement in the financial services industry – and the search engine “behind the scenes” would surface related content from our knowledge base. Back then, there were some promising technologies that were headed in the right direction, but nothing quite materialized to solve that challenge. What we were really envisioning was search without having to search – where our computers would just know what we needed and deliver it! Discover view in the browser. The Future of SharePoint is Here – and it’s all about Us!